In North American culture, bats are portrayed as scary creatures. Fortunately for me, I learned at a very young age that bats eat mosquitoes; and since learning this, I have always viewed bats as friends. Most of my permaculture designs call for bat houses, but this element of the design is usually ignored by those implementing the design or is met with strange looks when I suggest the idea. I hope this piece will explain my desire to incorporate bats into designs. About 70% of the more than 1,000 species of bats in the world are insectivorous.1 They assist us in controlling biting insects, but their use in insect control is much broader than this. Recent research from the Smithsonian Tropical Research Institute in Panama shows that bats are vital in controlling plant-eating insects. In control plots with free access for birds and bats, only 4.3% of leaf area was lost to insects. Plots with birds excluded (i.e. relying solely on bats) lost 7.2% of their leaf area. But plots with bats excluded, relying just on birds for insect control, lost 13.3% of their leaf area.2 Furthermore, plots with birds excluded had 65% more insects on the plants compared to the control plot, whereas plots with bats excluded had 153% more insects. Feeding by insects on bat-excluded plots was 209% greater than the control plot, with bird-excluded plots being only 67% greater!3 In other words, in tropical forests at least, bats are more important for insect control than birds. Surely bats play a significant role in insect control in other climates within their range as well. For this reason, I feel they should be a part of permaculture design whenever possible. In the tropics of the Americas, bats can assist in reafforestation. Research by the Leibniz Institute for Zoo and Wildlife Research carried out in Costa Rica found that between 5 and 20 times more seeds are dropped around man-made bat roosting boxes than in areas without the boxes.4 The bats of the Neotropics tend to disperse many seeds of pioneering species, making them potential partners in reafforestation work. Locating bat houses over gardens takes advantage not only of their insectivorous activities, but also of bat guano, a rich source of nitrogen and phosphorus. Despite this, there is no need to go running in terror at the site of a bat. Bat roosts can be located accordingly (i.e. 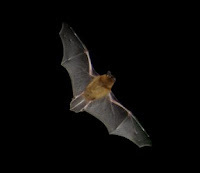 not next to homes); and any suspected bat bite should be seen to by a physician. Additionally, their tendency to control the populations of mosquitoes and other biting insects can make them agents of disease reduction rather than vectors of disease.